Reykjavik (AFP) Ice–land announced Friday it has increased its 2014 quotas for whaling in a move likely to intensify international condemnation of the practice. The country’s fishing ministry said the hunting and killing of minke whales would be increased by six percent, from 216 in 2013 to 229 in 2014. The hunting quota for rorquals — which includes blue whales, humpback whales and fin whales — remains unchanged at 154. 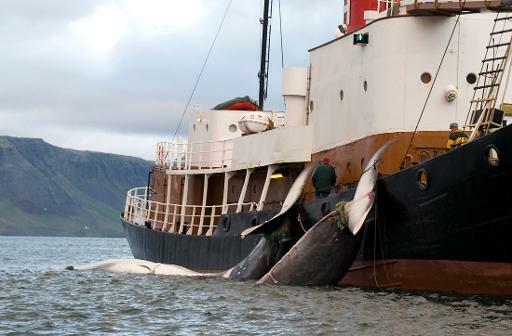 In 2013, Iceland’s whalers did not reach the quotas permitted by their government, killing only 134 rorquals and 38 minke whales. Since it resumed whaling in 2006 despite an international moratorium, Iceland, along with Norway, has come in for furious criticism from environmental groups and some other countries. Icelanders eat little whale meat, and most of the catch is sent to the Japanese market. Japan also hunts whales, but qualifies the activity as scientific research, even though whale meat finds its way to its restaurants. Australia and New Zealand have taken Japan to the International Court of Justice in The Hague over its activity. The court in July said it was deliberating on the issue and would give its verdict at some future date.